The Alexanders plant (or Alexandrian parsley) has some similarity to celery in the way it looks, with a flavor somewhere between celery and parsley but slightly more bitter. Used much the same way as celery or lovage, the stems can be blanched like asparagus, the roots can be baked, boiled, or fried like many other root vegetables and the leaves can be used as a stock vegetable and are particularly useful in soups. The yellow-green flower buds, leaves and young shoots can be eaten raw or added to salads and have an agreeable almost nut-like taste while the seeds are spicy and used as a pepper substitute. Alexanders (Wild celery) was once used in many dishes, both blanched and raw, but it has long since been replaced by celery. Alexanders are native to the Mediterranean but are found well into western Asia and North Africa and believed to have been introduced into Britain by the Roman Empire. At one time the Alexanders plant was grown extensively for its edible leaves and stems and enjoyed centuries of popularity but now, it is rarely used, having been replaced by celery. Today, Smyrnium olusatrum (Alexanders) retains some of its former popularity primarily as a pot herb; its this use from where its name is derived; the name, olus, "pot herb", and atrum, "black" (referring to the black seeds). Smyrnium is from the Greek smyrna, or "myrrh", referring to the rich aroma of these plants. Alexanders (Horse parsley) is still found growing wild in many parts of Europe and is a common find among the sites of medieval monastery gardens. Alexanders (Wild Celery) thrive along the coast and grow vigorously within a few miles of the shoreline. Alexanders is a biennial (a flowering plant that takes two years to complete its lifecycle) herb that usually flowers in late spring and the black fruits appear in its second year. These plants are aggressive growers that can be very invasive in the garden if not controlled by cutting the plants before they seed. This behavior has prompted some to value its use to naturalize an area. The Alexanders plant remains green well into winter and is known for attracting wildlife. The flowers are fragrant and smell much like honey, plus they are good for attracting bees and other beneficial insects. 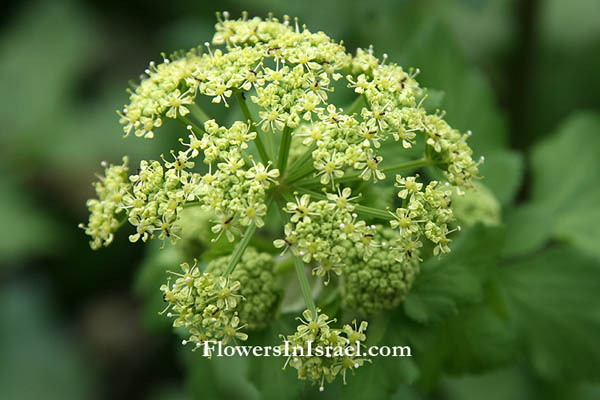 Alexanders flower from May to June, and the seeds ripen from June to August. The Alexanders seeds produce a strong myrrh-like scent that is highly aromatic. Historically, Alexanders were used to treat a number of maladies including stomach problems, asthma, menstrual problems and open wounds, but most professional herbalists consider it obsolete. As a medicinal plant it once claimed remedies for use as an appetite stimulant, mild diuretic, a source of vitamin C and as an antispasmodic. Gourmet spices, rubs, recipes and gifts for the home cook.